We are not a retail bakery but the commercial kitchen space where we bake does have a shared retail store. For us, bread is art. Flour, water and salt are our media. Fermented dough is our canvas. But to find the real beauty in our loaves you must tear through the rustic shell to see, smell and taste what lies within. With every loaf, we try to honor the hard work of our farmers and millers by using time honored baking techniques that coax maximum flavor and nutrition out of the organic grains. This is not factory bread. From the field to your table, many hands are behind the creation of this loaf, and with you, it ends. While enjoying with friends and family, we hope you’ll take a moment to appreciate the origin of your bread. 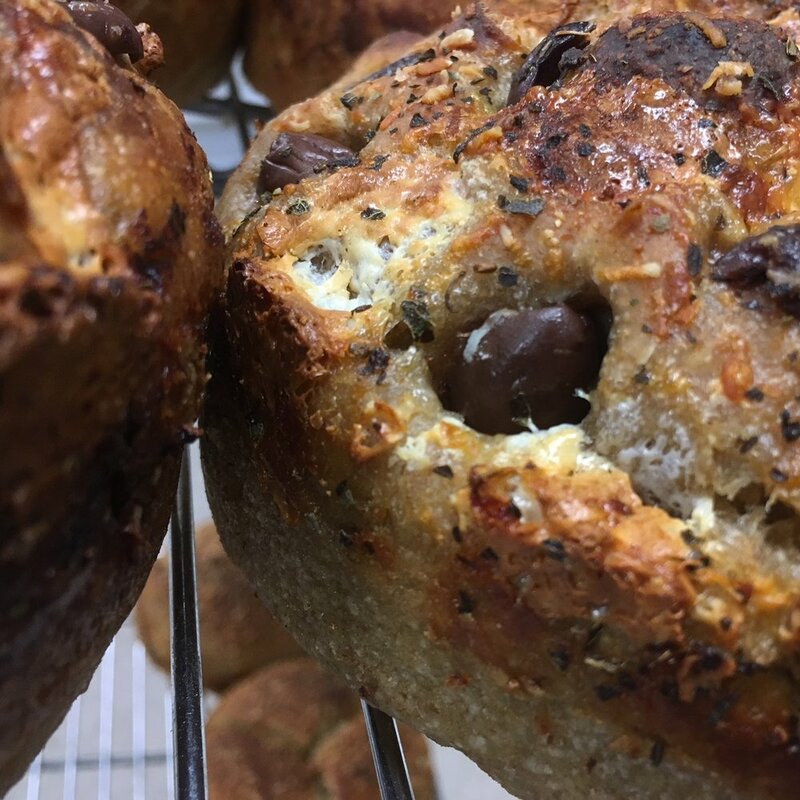 is dedicated to baking small batches of handcrafted and long-fermented sourdough breads using organic grains grown and stone milled in Wisconsin. We’re working on getting a larger oven and more kitchen space, and once that’s sorted (hopefully Spring 2019), we’ll be launching a bread subscription service based on the Community Supported Agriculture model. Once up and running, we’ll use it as a platform for sharing experimental breads not available in stores. Please sign up and we’ll email more information soon. [ A FEw OF OUR MOST POPULAR LOAVES are listed below. Our signature loaf is made with a blend of organic whole wheat and rye flours. Expect a moist, chewy crumb, full flavor and mild sourdough tang. Made with 100% whole grain organic wheat, this is a hearty, flavorful loaf named after Wisconsin’s Driftless Area where the wheat is grown. Our country loaf made with a blend of sifted and whole grain organic wheat flours. For these loaves we substitute a percentage of our normal wheat with a heritage grain, including Turkey Red, Red Fife and Spelt. Our ORIGINal loaf studded with toasted sesame, flax, millet and sunflower seeds. A whole wheat loaf with a tighter crumb; makes amazing toast and superb sandwiches. Good bread, sliced. Our popular 100% whole grain loaf served up sliced. Spent beer grains add extra flavor, texture and nutrition to this wheat and rye loaf that brings beer and bread even closer together. A whole wheat loaf made with organic rolled oats, for a creamy crumb. Try it toasted. The corn polenta added to this wheat loaf gives it a creamy crumb, natural sweetness and extra depth of flavor and nutrition. Our focaccia is a long ways from the drab table bread found in too many restaurants. The moist, chewy crumb is bookended by crispy, olive oily crust topped with goodness. This is not dinner bread as an afterthought. Our rustic sourdough baguette is not shy on flavor. You can purchase ORIGIN Breads products at several Madison markets, restaurants, farmer's markets and at our kitchen. Bread Pick-up: On Tuesday-Friday, customers are welcome to stop by our kitchen to pick up fresh bread. Because we’re not really set up for walk-in customers, please call or message in advance to make sure we still have loaves left at the kitchen. We love our customers and enjoy real person interactions at the farmers markets, but those aren’t every day (or year round), and without a retail location, the best way to keep tabs on us (for better or worse) is on social media. Please follow us.